Part 1 of a 6-issue mega-event: I.D.I.C! 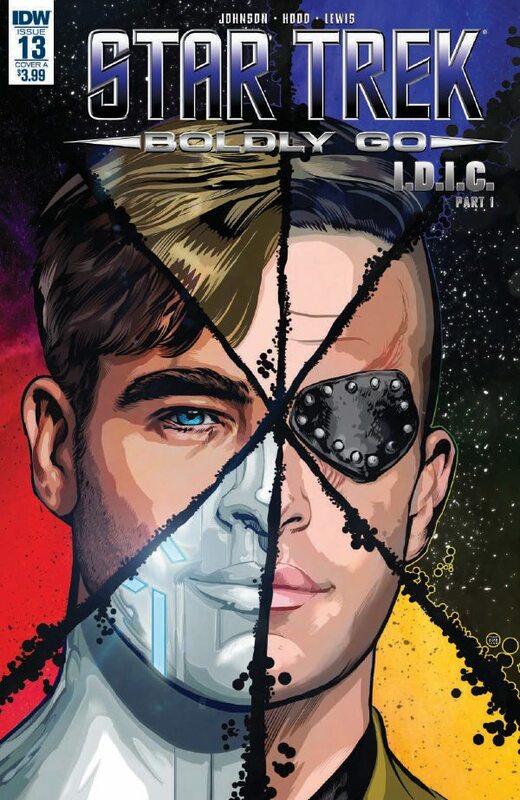 Scores of realities collide as “Infinite Diversity in Infinite Combinations” takes on a new meaning for Captain Kirk and his crew… with the fate of all realities at stake! 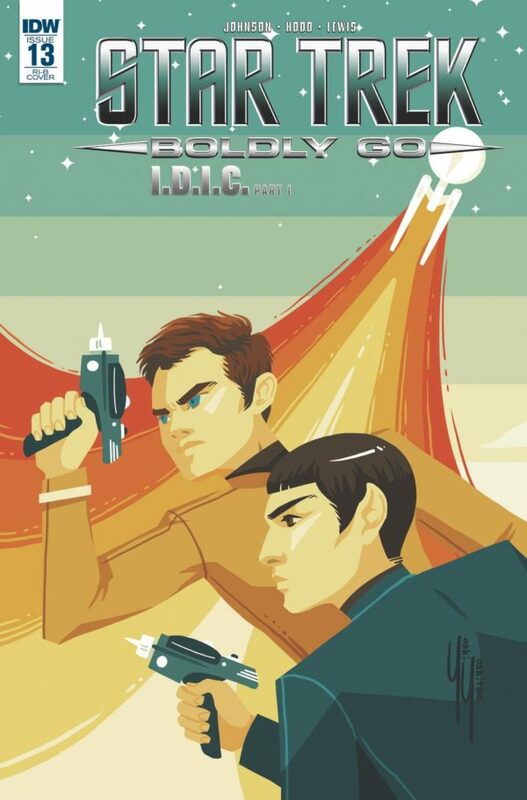 Star Trek Boldly Go #13 launches with a brand new tale from Mike Johnson and with the artwork being handled in this issue by Josh Hood (JLA, Venom: On Trial). Titled I.D.I.C. or if you prefer the version where you need to take a big breath, Infinite Diversity in Infinite Combinations. This story is set to be a rather large six-part comic event. Kirk and Sulu – aboard the U.S.S. Endeavour – are catching up with Spock and Uhura who are still upon New Vulcan The Enterprise family is spread far and wide across space, though this doesn’t stop Kirk having fun at Spock’s expense, teasing him by dropping hints that Sulu is making a good First Officer. With Uhura stepping in to make sure her partner is aware of such hi-jinx, the communications end with good spirits. After these talks end both Uhura and Spock discuss returning to Starfleet and ultimately the Enterprise, with their conversation drifting to how their lives could have been different, if they don’t go back. Little do they know that the Endeavour has picked up some strange readings that they witnessed many months back. Meanwhile aboard the U.S.S. Enterprise Captain Pike is chastising Commander Grayson for not beaming him off planet Nibiru. I like Star Trek comics when Mike Johnson can create, when he can devise a whole new universe for our characters and make them do unexpected things, when they surprise us. As such I’m already feeling the love of I.D.I.C. and I’ve only just closed the covers of issue #1. Here’s a Trek comic that giving us NuTrek and also calls back to something Mike Johnson first sprung on us way back in January 2014. Along with this, Mike’s then brought in a vicious new Kirk that would make the Mirror Universe Kirk complain that “He’s playing a little to rough”. Already issue #1 is singing of something brilliant. To top this excellent introduction off, not only do we get some splendid artwork and colours from Josh Hood and Jason Lewis, but we get a plethora of excellent covers from the likes of Tony Shasteen (main cover), Tana Ford & Triona Farrell (Cover B) and Yoshi Yoshitani (Retailer Incentive B). You will want all three when you catch a glimpse. Infinite Diversity in Infinite Combinations is what every excellent Star Trek comic book should be. 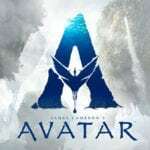 You have the crew, the banter, the energy, the mystery, the excitement and a cliffhanger to leave you hanging. This is a Star Trek comic.